With all the new and changing technology available to online casino games designers, some of the new ones are getting pretty elaborate. Bigger, more brilliant images and amazing built-in bonus games have become the norm! But with all the bells and whistles out there, it seems there’s still a place for good old cherries, lemons, sevens and bars! Slotland has just added a traditional pub-style fruitie to its selection. 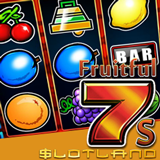 The new Fruitful 7s has classic fruit symbols and payouts up to 2500x in the bonus round. It has a free spins feature where YOU choose their prize multiplier. This week you can get a $10 freebie to try it ($17 for VIPs). There's also a variety of match bonuses available. Fruitful 7s has mostly traditional fruitie symbols. But one Fruitful 7s symbol that isn’t found on the fruit machine in the pub is its “Free Spin” scatter symbol. Three of these anywhere on the reels triggers free spins. Before the bonus spins begin, you select a prize multiplier. If you choose the 1X multiplier your chances of winning are greater but payouts are bigger if you choose the higher 3X or 5X multipliers. $10 freebie to try new online slot game is available until April 1st. 17X wagering requirement; valid for Fruitful 7s only. 12X wagering requirement; may be claimed twice a day; valid for all slots and progressive jackpot games. 10X wagering requirement; may be claimed twice per day; valid for all slots and progressive jackpot games. These bonuses are valid March 28 to April 1, 2017 only. Slotland has been entertaining players all over the world for more than 18 years. Many of its real money online slots are tied to a site-wide progressive jackpot which is currently over a quarter million dollars and due for a win.